Msgr. Falvey died at his home in Newport Beach, Calif., at 85. 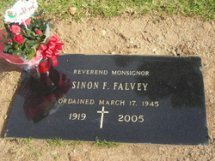 Ordained to the priesthood on March 17, 1945, Monsignor Falvey had served as the pastor of St. Norbert Church, Orange, Calif. from 1970-89; he became a monsignor under Bishop William R. Johnson in the newly created Diocese of Orange. Monsignor Falvey had been a member of the President's Council at Holy Cross Magazine. He is survived by two sisters, Marie & Peggy; many nephews and nieces; and grandnephews and grandnieces. 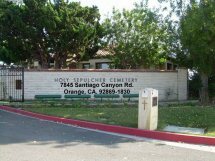 Preceding him in death was his sister, Agnes Falvey Caballero (1912-2003).